Our award-winning multifunction printers speed up your output and streamline your workflow with multifunctional productivity — printing, copying and scanning with simple on-screen control, seamless software integration and all the options you need for right-size scalability in any business or professional application. Fast, reliable and consistent multifunction performance doesn’t have to come at a high price. 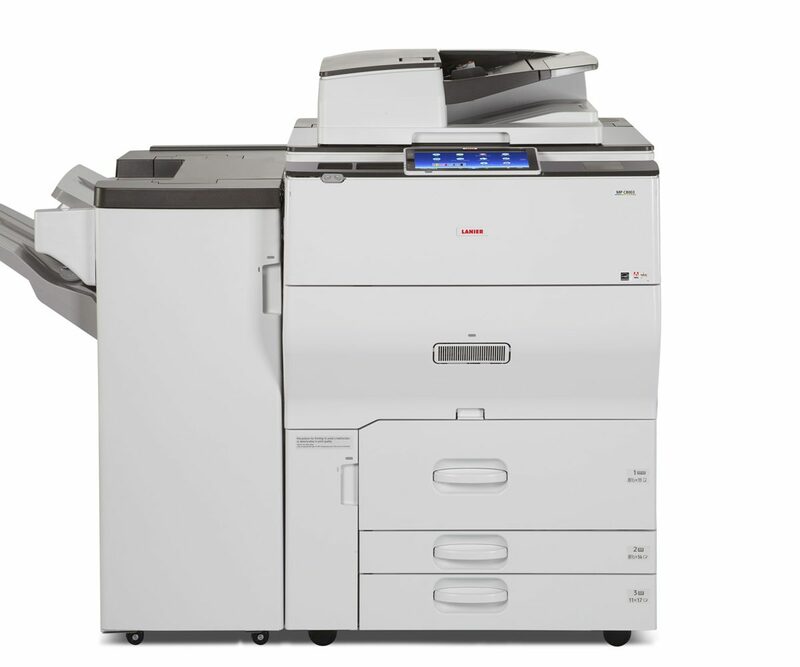 Compact and easy-to-use with multiple connectivity options, the SP 325SFNw Black and White Laser Multifunction Printer (MFP) fits into any small office with minimal upfront costs. 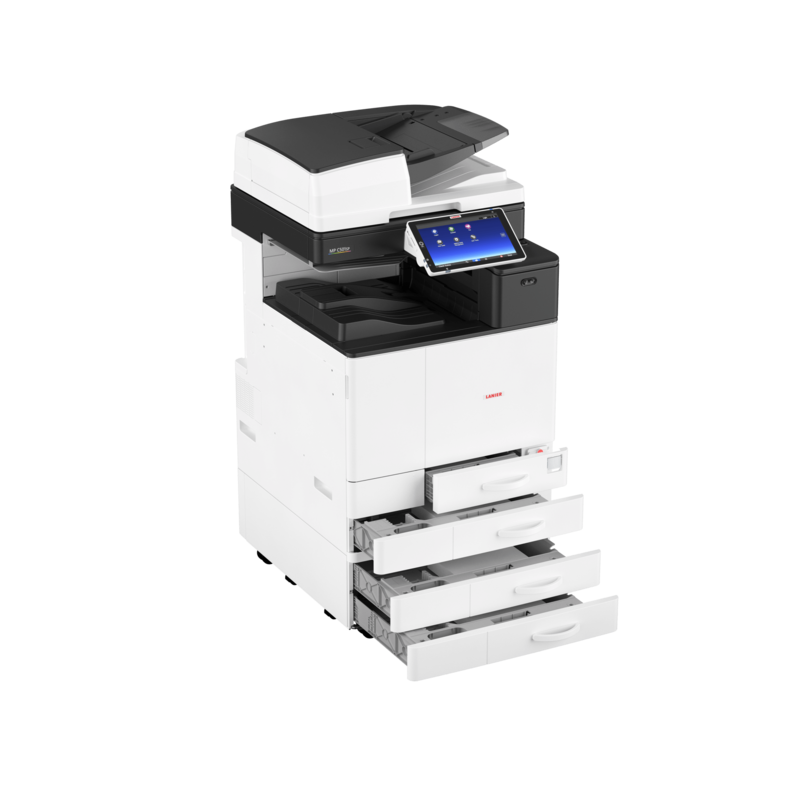 Easy to set up, the SP 325SFNw offers mobile convenience, versatile media support, and simple maintenance with its 3,500-page yield All-in-One Print Cartridge. Keep ideas flowing. Print black-and-white output at up to 1200 x 1200 dpi. Process multiple jobs effortlessly via a powerful controller and extensive memory. Use the 35-Sheet Automatic Reversing Document Feeder to load originals quickly for one- or two-sided copies. With the 4.3″ color touchscreen, you can find important details, check settings and preview prints with a tap of your finger. Find the easy answer to some of your most demanding workplace challenges. Add the LANIER SP 377SFNwX multifunction printer to your small office or workgroup. Take advantage of a wide range of space- and budget-saving features to share information with customers and coworkers quickly, consistently and conveniently. 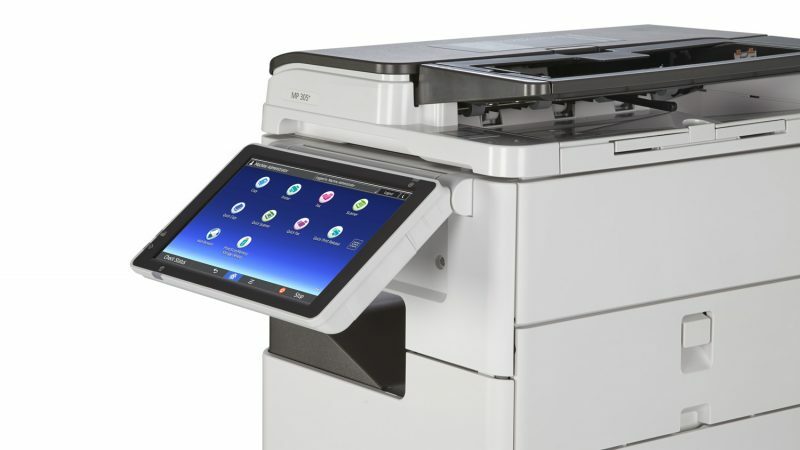 Choose from several connectivity options, including wireless LAN and Wi-Fi Direct®, to simplify placement and setup, using your personal mobile device to print or share information. With the extended-use All-in-One Print Cartridge, you can minimize maintenance tasks and the need for technical assistance. Accomplish more with the LANIER SP 4510SF Desktop Black and White Multifunction Printer for all-in-one power to copy, print, scan and fax. A powerful controller with a standard 1 GB of RAM can easily handle simultaneous print jobs and large files. Expect professional print quality of up to 42 pages per minute at 1,200 dpi. Plus, add two 500-sheet paper units for a 1,600-sheet total capacity for smooth, uninterrupted print jobs. The best laser multifunction printer for your startup or small workgroup should enhance collaboration, raise productivity and offer a low total cost of ownership (TCO). 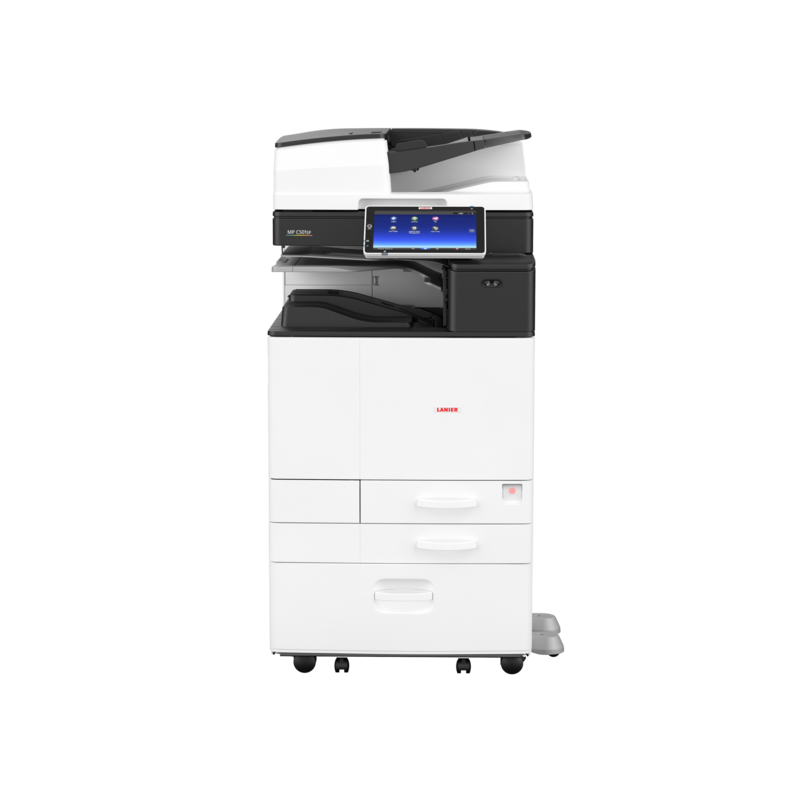 Introducing the LANIER SP C261SFNw Color Laser MFP, a powerful, yet compact device designed for personal users or workgroups of up to three people. You’ll save time by printing up to 21 pages per minute (ppm), and capture and share information efficiently with copy, scan and fax capabilities. The 21 page-per-minute LANIER SP C262SFNw Color Laser Multifunction Printer optimizes printing, faxing, scanning and copying so small companies can communicate more efficiently. This compact device delivers big results  including increased productivity and professional-quality color copies and prints that will impress both your customers and coworkers. Plus, it fits easily on home-office desks, under retail registers and hotel front desks, and on side desks in office reception areas. The reliable and robust SP C360SFNw and SP C361SFNw multifunction printers are ideal for small businesses and teams of up to four people. Compact in size, but big on intelligent features, they come standard with a Smart Operation Panel that delivers tablet-like functionality. The Single-Pass Document Feeder lets users scan double-sided documents in a single pass. Users can also slide ID cards or receipts through the MFP’s dedicated card slot to easily scan and copy. No matter whether a document lives on your laptop, tablet or phone, with these systems you will be able to get it there fast. Plus, with multiple types of built-in authentication, IP Filtering, SSL/TLS and more, you get enhanced network protection to help keep your information assets secure. Raise your expectations — and improve your productivity. The LANIER MP 301SPF offers advanced capabilities to streamline workflow and reduce total cost of ownership. Use it to produce fast, black-and-white output at 31ppm, share electronic documents, protect sensitive information and optimize IT resources cost-effectively. With its unique combination of powerful, reliable performance and intuitive management in a compact design, it offers incredible value as the primary multifunction device in an office or as part of an integrated Lanier Managed Document Services (MDS) strategy throughout the enterprise. Expect the MP 301SPF to exceed your low-volume, desktop multifunctional product demands without compromising space or the budget. Meet the MP 305SPF, LANIER’s all-new hybrid black & white multifunction printer. Low cost and big on capabilities. Designed for companies that typically require letter-sized output, but also want the flexibility to bring ideas to life at sizes up to 11″ × 17″. Access the cloud, integrate customized solutions and print, copy, scan and fax all from one smart MFP. No matter what your day brings you, the MP 305SPF puts powerful solutions right by your side, so you can keep focusing on what’s next. Produce letter, legal and 11″ × 17″ output at 30 pages-per-minute with resolutions up to 600 x 600 dpi. This ultra-convenient, network ready system supports PCL, PostScript and Mobile Device printing (XPS Direct Print optional). Standard automatic duplexing makes it easy to create two-sided documents, saving paper, minimizing waste and reducing costs. The 10.1 inch full-color, softkey Smart Operation Panel comes standard and offers you a host of new ways to streamline your workflow. Deploy customized solutions, integrate multiple processes and simplify complex tasks to improve business communications. With tablet-like functionality, and easy adjustment for maximum viewability, you’ll experience control in a sleek and elegant way. Additionally, USB and SD slots, NFC capability and Bluetooth options further expand how you can interact with and share information, while you are at the MFP or away from it. With the integrated Web Browser it’s easy to navigate web pages, access cloud-based applications and print HTML and PDF content directly from the Smart Operation Panel, with no computer or additional smart device required. Learn how to make even more use of the MP 305SPF’s robust functionality with helpful how-to videos you can watch right from the control panel. Tablet-like functionality delivers a sleek and elegant user experience with direct access to cloud-based solutions. USB and SD card slots are built right into the control panel, and NFC capability and Bluetooth options further expand how you can interact with and control the MP 305SPF. Embedded USB and SD card slots are accessible from the panel. This allows you to print from or scan directly to your storage media, without a computer. Supports mobile device connectivity and provides an affordable, easy-to-implement option for user authentication. Easy adjustment for maximum viewability. The standard internal paper tray holds up to 250 sheets of letter-sized paper. For users wishing to upgrade capacity, the optional 500-sheet paper tray can be added, increasing total holding power to 760 sheets. Need to print a legal-sized or 11″ × 17″ document? Simply use the bypass feeder to load up to 10 sheets of A3 media at a time. Think big — by going small. Use the compact LANIER MP 402SPF to share information quickly in small- to mid-sized workgroups. Handle everyday document management tasks — including printing, copying, scanning and faxing — with speed and precision right from the desktop. Find information, transition between tasks and complete jobs faster with a single swipe, scroll or tap on the large, 10.1″ color touchscreen. Print up to 42 black-and-white pages per minute and move critical information quickly. Copy notes, invoices, presentations and more at sizes up to 8.5″ x 14″ with impressive image resolution up to 1200 dpi. Use the standard Single Pass Document Feeder (SPDF) to convert up to 80 images per minute into an electronic file and share it instantly with multiple Scan-to options. Send contracts and other forms directly to your inbox with the low-cost and convenient Cloud Fax app and eliminate the hassle of checking for received faxes at the device. Expand paper capacity up to 1,600 sheets and use the 100-Sheet Bypass Tray for specialty media, including thicker stocks, unique sizes and even banners. 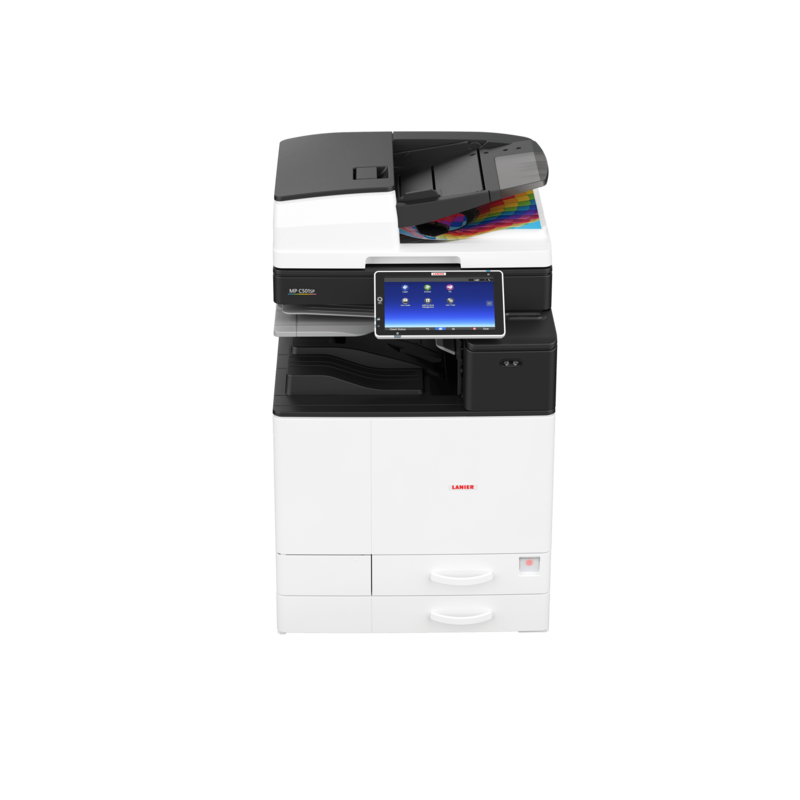 Introducing the compact MP 501SPF/MP 601SPF, a fully featured multifunction printer designed specifically for midsize workgroups that manage a wide range of document tasks. Print and copy up to 8.5″ x 14″ documents and scan originals from a versatile device that can be placed almost anywhere. Or, place it in shared-use settings — including PC, Mac and host printing environments — to improve everyday workflows. Take advantage of extensive fax capabilities to transmit important contracts and other documents digitally and avoid typical transmission costs. In fact, faxes can be sent directly to your email inbox, so you don’t have to repeatedly check for received faxes at the device. Every day brings something different. Be ready for all of it with the MP 501SPF/MP 601SPF. Print a wide range of documents at up to 62 pages per minute and transition between jobs quickly. Copy handwritten notes clearly with sharp lines and precise text up to 1200 x 1200 dpi. Scan black-and-white or full-color originals and share them immediately with a host of Scan-to capabilities. Add optional paper trays to extend paper capacity up to 2,600 sheets for fewer interruptions. Besides toner replacement, the device is designed specifically to be almost maintenance free, so you can spend less time replenishing supplies and more time on accomplishing tasks. The MP 2555/MP 3055/MP 3555 multifunction B&W systems put usability front and center – because today’s workflows demand it. These top-of-the-line units are ideal for fast-paced environments that depend on sophisticated features to support complex workflows. They come standard with PostScript3 Emulation, offer exceptional MFP functionalities and 1200 x 1200 dpi image quality for fine lines, razor sharp text, and the most accurate grayscales. Plus, different paper capacity options give users the flexibility to load multiple stocks and sizes at the same time. 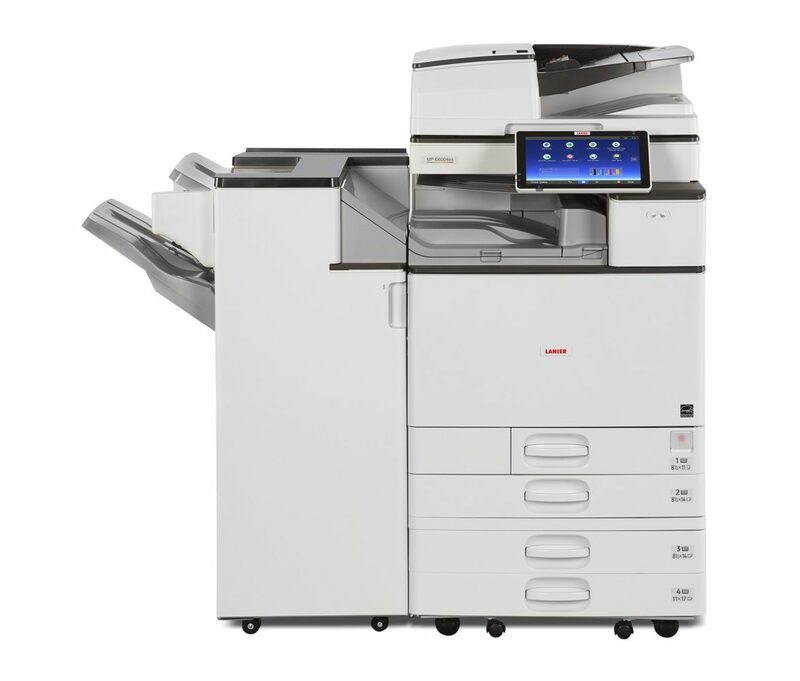 With speeds up to 35 pages-per-minute, a full line of finishing capabilities, support for mobile device printing, and a robust processor, users can perform everyday office tasks with ease. And they can do it all without compromising security or their commitment to the environment. Impress audiences while eliminating outsourcing costs with optional stapling, hole punching and booklet finishing for up to 11″ x 17″ sizes. Use the internal, space-saving Multi-Fold Unit to automate different types of folding jobs. Choose the 1,000-Sheet Hybrid Staple + Stapleless Finisher for automated staple-free finishing on documents with five or fewer pages — making it ideal for schools, hospitals and offices where safety and recycling are especially important. your budget. Take advantage of its many eco-friendly features including a low Typical Electricity Consumption value of 2.6 kWh/week. 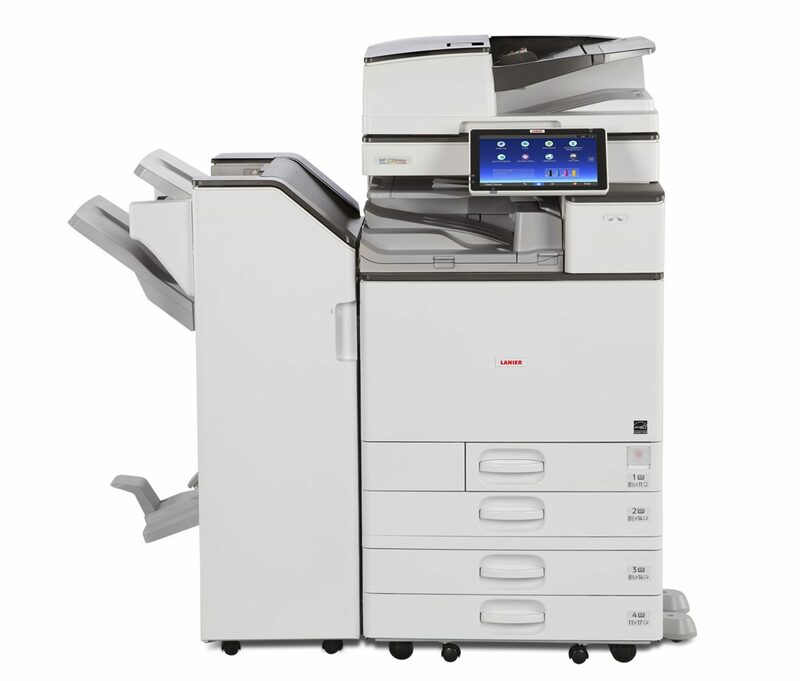 The MFP is ENERGY STAR® certified and meets EPEAT® Gold criteria*. We left some of the energy-saving options up to you. For example, you can schedule the MFP to power down when the office is empty and keep duplex printing as the default to reduce paper costs. 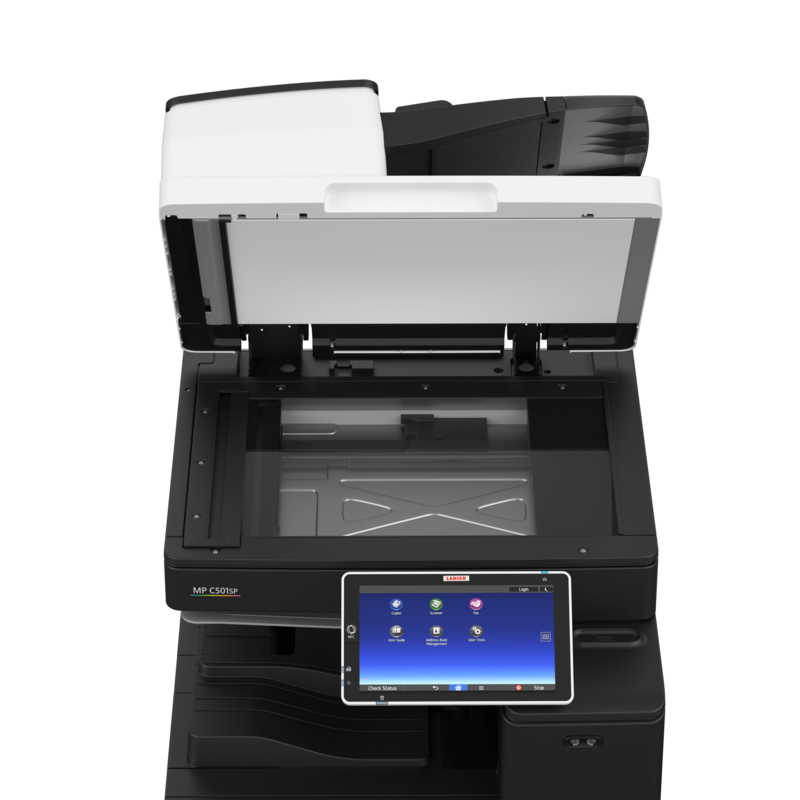 The MP C401/MP C401SR is a powerful digital multifunction device that combines fast color output, advanced scanning and powerful security to simplify everyday tasks. This compact, affordable MFP offers a host of customizable features and user-friendly controls, so you can tailor it for your office, workgroup and workflows. Use it as your workhorse device, or add it as part of your Managed Document Services (MDS) strategy to improve efficiency throughout your organization. Thriving organizations move quickly. Are you using technology that can keep pace? The LANIER MP C401/MP C401SR offers a wide range of features so you can copy, print, store and share documents and move on to the next project within moments. It produces up to 42 color or black-and-white pages per minute for 8.5″ x 11″ output and up to 32 ppm for 8.5″ x 14″— on a wide range of media types. It stores up to 2,300 sheets for fewer workflow interruptions. The powerful MP C501 multifunction printer is designed specifically to accommodate the unique needs of today’s smaller workgroups. This affordable and versatile device combines advanced scanning and optional faxing with robust security features, responsive support and impressive finishing to keep information and work flowing effortlessly. Plus, it offers a host of customizable features, support for mobile printing and optional cloud apps to complete every task, every time. With this system you’ll be able to collaborate with coworkers, clients and others seamlessly. Make an immediate impact by moving information quickly. Print high quality color output with resolution up to 1200 dpi at speeds up to 50 pages per minute (ppm). Or, share them electronically with advanced scan-to and optional fax capabilities. Store up to 3,000 documents on the Document Server for faster access to regularly used forms. Use the ID Card Copy feature to copy and scan two-sided documents, such as identity cards, on one side of a sheet of paper. Add Lanier and third-party software solutions, including GlobalScan NX™ or Streamline NX™, to automate repetitive everyday tasks. Reduce workflow interruptions by adding optional paper trays to expand paper capacity up to 2,300 sheets. When you’re short on time, tight on space and worried about stretching your budget, choose the MP C2004EX/MP C2504EX to manage every project. Produce stunning handouts, flyers, notes, invoices, banners and more at speeds up to 20 and 25 pages per minute. When you want to share information instantly, use the 100-Sheet Automatic Reversing Document Feeder (ARDF) to expedite the scanning process and share digital files via a multitude of scan-to capabilities. You can fax contracts and other forms just as quickly. In fact, you can send and receive faxes between email inboxes to save on paper, transmission costs and trips to the device checking for confirmations. These color systems are designed to give small businesses and workgroups the power and intelligence they’ve been looking for in a multifunction device. 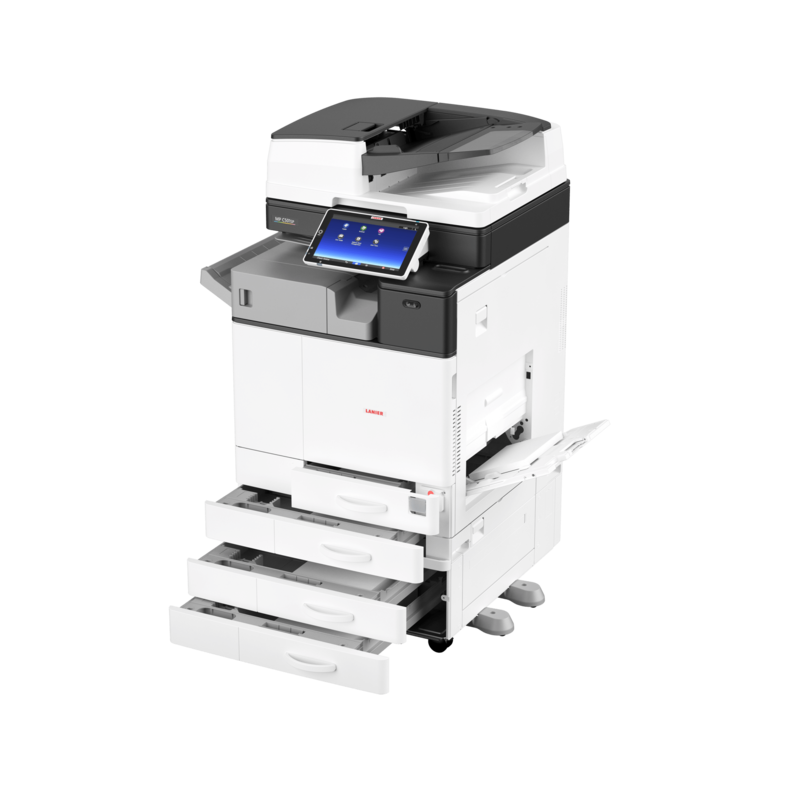 Both models feature our Workstyle Innovation Technology and come standard with PostScript3 Emulation, PDF Direct Print Emulation, and a Smart Operation Panel that works just like a smart device. This series also offers comprehensive new smart support capabilities that, when enabled, can be used to help provide better system uptime and availability. Finishing options include a 1,000-Sheet Booklet Finisher, 250-Sheet Internal Stapleless Finisher and 500-Sheet Internal Staple Finisher. With these systems users receive the tools and technology they need to simplify complex workflows, improve communications, create vibrant color documents and meet rigorous security requirements. There’s no shortage of things to do or information to share, but you are short on time. Use the MP C3004EX/MP C3504EX to perform everyday office tasks with incredible speed and ease. With a built-in motion sensor, the Smart Operation Panel responds with half-second recovery from Sleep Mode when the user taps on the panel to begin job entry. Print colorful presentations, images, brochures and more at up to 30 or 35 pages per minute and grab them on your way to an important meeting. Send full-color scans of floor plans, schematics and photos via email. Copy handwritten notes for your colleagues. Send a contract via fax without wasting paper or wondering if it was received. With an optional maximum paper capacity of up to 4,700 sheets, you can manage more projects with fewer interruptions so you can transition quickly from one revenue-generating project to the next. 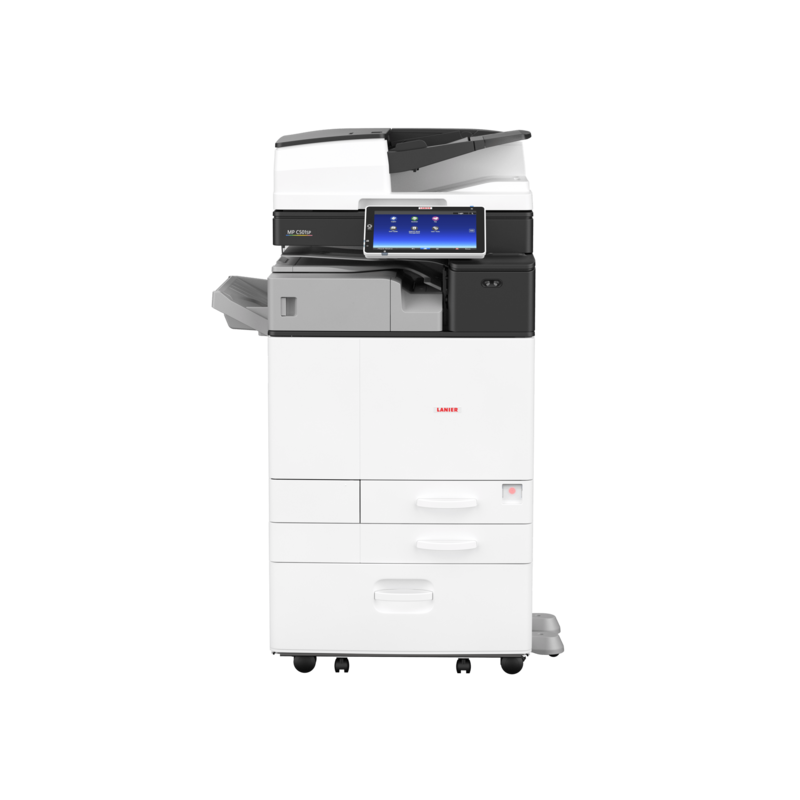 The MP C4504EX/MP C6004EX multifunction color systems are ideal for fast-paced, high-volume business environments. They feature our Workstyle Innovation Technology and come standard with PostScript3 and PDF Direct Print Emulation and a Smart Operation Panel that works just like a smart device. These sophisticated systems deliver in exciting ways–support for mobile printing, advanced security, intelligent tracking and eco-friendly options. Plus, for end-to-end document production, they offer a full-suite of finishing options including a 500-Sheet Internal Finisher, 3,000-Sheet Finisher, and 1,000-Sheet Hybrid Finisher for stapled or staple-less output. Make an unforgettable impression by producing compelling images and documents with densely rich colors for more lifelike reproductions at up to 1200 dpi resolution. The MP C4504ex/MP C6004ex re-calibrates itself as it processes files, which means colors never deteriorate and text and lines stay incredibly sharp page after page. Expand your reach by printing on a wider, thicker range of paper stocks — up to 12″ x 18″ sizes and 300 gsm/80 lb. Bond. You can even create posters and banners that would normally be reserved for wide-format devices by combining multiple pages into one image. Want to save on outsourcing costs? Choose the optional Fiery® E-23C Color Controller and produce spot color professional output using the gamut of RGB and CMYK colors. Every day brings something different, but at least you’ll know how to get it done quickly with the reliable MP C6503/MP C8003. It includes a motion sensor that wakes up the control panel automatically from sleep mode as you approach, so can you can start multitasking immediately. Take advantage of output speeds that reach up to 80 pages per minute to print and copy notes, invoices, handouts and other forms with incredible speed and precision. Scan originals via a 220-Sheet Single Pass Document Feeder (SPDF) and choose from a wide range of Scan-to capabilities to share them electronically in only moments. Print impressive brochures, proposals and more with breathtaking colors at up to 1200 x 4800 dpi. Take advantage of PxP-EQ toner technology and continuous calibration. Load more types of media, including envelopes, thicker stocks and print banners up to 49.6″. Use full-bleed printing on three edges for signage.